Nautilus Investigations – Our Team – Experience. Efficiency. Excellence. Our Team – Experience. Efficiency. Excellence. Here at Nautilus Investigations, we believe that our well-rounded, experienced team is second to none. Every member of our investigative team is licensed as a private investigator, and several team members are also licensed as Independent All Lines Claims Adjusters and State of Florida Notary Publics. All of our personnel are cross-trained to handle a variety of casework, and regularly attend admiralty and intellectual property rights seminars and symposiums, along with industry-wide training courses and continuing education. Our investigators and adjusters have testified as witnesses on various subjects and cases, and we handle each and every case with the expectation that court testimony will be required on our behalf. Since 1982, Glenn and Nautilus Investigations have regularly and successfully conducted Intellectual Property Rights investigations. Widely recognized by industry and law enforcement as an Intellectual Property Rights (IPR) expert, Glenn regularly speaks on IPR issues and delivers training presentations to various federal, state and local law enforcement agencies, including U.S. Customs. Glenn and Nautilus Investigations have received letters of commendation and appreciation from many of those agencies, including U.S. Customs, for joint efforts with regard to prosecution of counterfeiters. Glenn has been active in and associated with a wide range of organizations over the decades, and is currently a proud member of the Ft. Lauderdale Mariner’s Club. Among other titles, Glenn previously served as Chairman of the Private Investigation, Recovery and Security Advisory Council, appointed by the Florida Secretary of State. Further credentials and supporting details can be provided upon request. 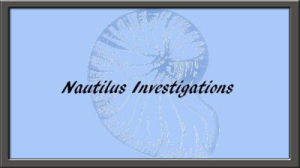 Over the years Tracie has worked in a variety of capacities for Nautilus Investigations. In August of 2013 she rejoined the company, renewed her Private Investigator License and quickly obtained her Independent All Lines Claims Adjuster license. Tracie can be reached at any time to discuss new and current matters. Born in Miami, Tracie has been on the water all her life. She earned a Bachelor’s degree in Psychology in 1992 and Master’s and Specialist degrees in Mental Health Counseling in 1995 from the University of Florida. Tracie has found a new application for the skills she obtained and developed as a counselor in her capacities as a licensed Private Investigator and licensed Independent All Lines Claims Adjuster. Throughout her life, Tracie has handled a variety of maritime claims throughout the United States and Caribbean. As a licensed Independent All Lines Claims Adjuster, Tracie adjusts and negotiates settlement of claims. She is involved in the mitigation of medical invoices and manages the distribution of Maintenance & Cure benefits and has attended mediations on behalf of insurers who provide her settlement authority. Tracie acts on behalf of trademark and copyright owners in efforts to protect their Intellectual Property Rights. She’s been involved in a variety of trademark and copyright enforcement actions to include civil seizures and enforcement actions. Nautilus Investigations: Experience. Efficiency. Excellence.